I had the intention of reviewing the new “lo-fi” Withings Activité smart watch. Lo-fi meaning that it looks like a normal analogue wrist watch, but has smart watch features like bluetooth, step tracking, sleep tracking and a promised swim tracking feature they have pushed back constantly for the last six months. This review turned out to become more of a warning to other potential Withings customers. It’s a good looking watch. A big reason why I prefer these watches is because I won’t have to recharge the battery every day (8 months battery time) and they do look better according to me, follow the link above, it’s a good looking watch. After a long time contemplating wether to get it or not after reading that they do not reply to emails and do not solve customer complaints in a timely manner, I decided that it cannot be that bad. I’m techy, I know how to work out the kinks of these devices I can do my own support. I went for the more expensive version, the Activité (without the Pop after it) that has swiss this and that and is supposedly of better quality. I like watches and I didn’t want it to feel like a lump of plastic on my wrist. Since it was not released at the time I put myself on their mailing list to get notified when released. I never got notified, I went on their website and by chance I saw it was in stock and ordered it. Not that long after I received the package with the watch. Probably the only good thing about this package. the app. The packaging is nice, a long sleek box with good quality print on it. Gets your hopes up doesn’t it? Opening the box everything looks OK so far. I unwrap the watch and start reading the instructions on how to pair it with your phone. Supposedly I am supposed to press a button (think factory reset buttons on routers) for x amounts of times using the included tool until the watch starts moving its hands. I try this many times without success, in the end I take to the classic router-reset-method and hold the button pressed for 10s and after I couple of tries I get it to vibrate instead of the hands moving and my phone could find it. 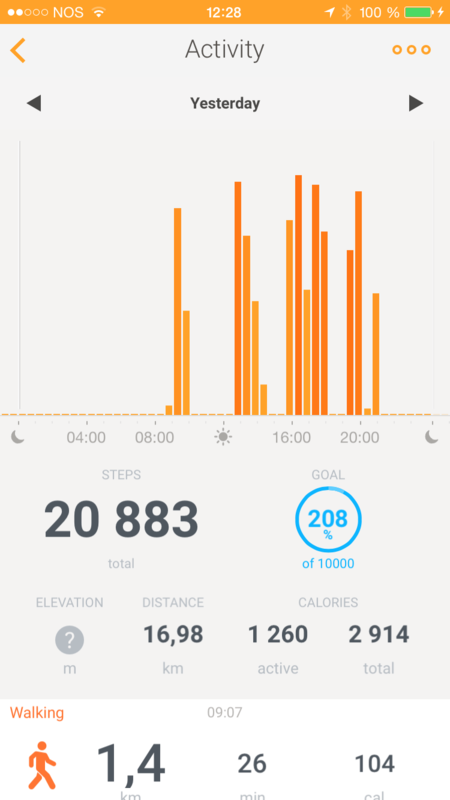 When paired the app finds the watch and you will now be able to get statistics from the watch such as steps and how you have slept during the night. These are all good features which are presented to you using a sleek user interface through the app. They manage to motivate you to do more, walk those extra steps to get a new badge and you can also compare yourself against other user profiles. The watch feels sturdy and changing the wrist bands between silicone and leather is easy as pie. So no complaints here. Did Withings send me a used Activité watch? Scratches on the back close to the battery hatch and reset button. Straight out of the box. This is where it all starts to go downhill. Upon further inspection and when trying to get the watch to sync with my iPhone I notice scratch marks on the back of the watch the most apparent being where you open the watch to change the battery with the included tool. 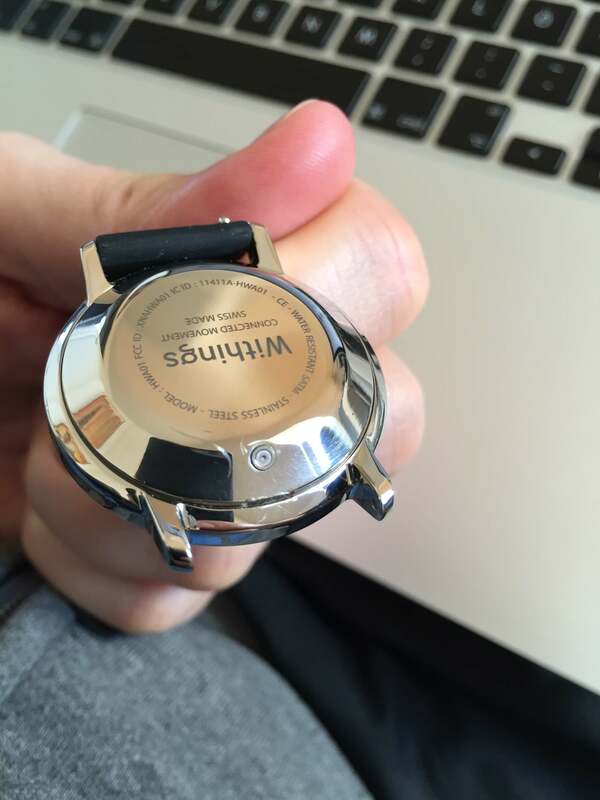 The principle here is that you should bend open the back it seems, and someone tried this on the watch I received I would assume. The marks are apparent and I just wonder how that is going to look after a few battery changes. Those are not reflections, but tiny scratches along more than half of the back. On the backside of the watch half of it is scratched as if someone went over it with steel wool. I tried taking some pictures of it and you can see it when the light reflects on it. The arms of the watch seem slightly bent upwards almost touching the screen, if this is intended or not I do not know. The swim tracking is slated to be available at the end of this month. To clarify, your replacement Activité unit would come from new, replacement stock so you would not need to wait for general availability to receive your new unit. On their website it now says end of June. You get the drift, quite unprofessional to continue pushing it forward for this long and I get the feeling there are other reasons be it technically or within their organisation that is affecting this. Features that are actually there include the, quite pointless, possibility to tap the screen twice and the hands will move to the time when the alarm will go off. Something you use once to show your buddies that the hands move magically across the screen, otherwise I think you will know for yourself when the alarm is set every morning, especially since you can only set one alarm. Tapping on the screen for me worked about 2 / 10 times, making it even less useful and a bit counter productive even when it comes to showing it off, if that is your thing. The alarm feature is a good idea, it vibrates for a while, but you have no possibility to turn it off once it starts to vibrate and you have no other features such as snooze which makes me not trusting it’s ability to wake you up. Plus setting the alarm in the app is a bit confusing. Now more than two months after sending it back I have received a refund. They claimed my emails got lost and that’s why it took so long. It took them more than a week to reply to my first initial support request and that was after calling them out on Twitter several times. After finally deciding that this is just not a good enough product and that I really don’t want to put my hard earned money into products that are not supported I decided to send it back for a refund. Now more than two months after sending it back I have received a refund. They claimed my emails got lost and that’s why it took so long. 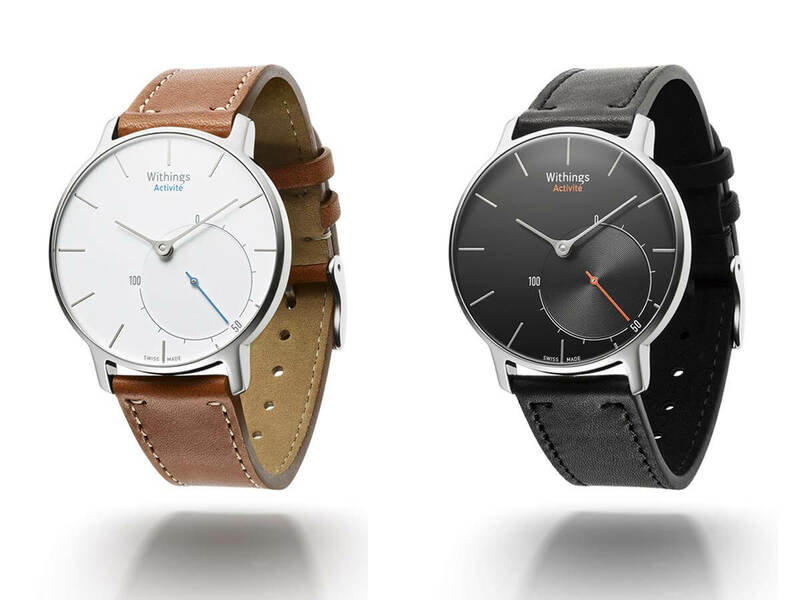 Stay away from the Withings Activité. If you still can’t stay away at the least you should opt for the cheaper Activité Pop or check out another smartwatch. I got my eyes on the Nevo watch which seems to cram some extra features in there such as SMS and phone notifications and hopefully they will deliver upon their promised swim tracking as well.